A recent market study published by the company “Cutaneous Mastocytosis Treatment Market: Global Industry Analysis 2013–2017 & Forecast, 2018–2026” consists of a comprehensive assessment of the most important market dynamics. After conducting thorough research on the historic as well as current growth parameters of the Cutaneous Mastocytosis Treatment Market, the growth prospects of the market are obtained with maximum precision. The report features the unique and salient factors that are likely to significantly impact the development of the Cutaneous Mastocytosis Treatment Market during the forecast period. It can help market players modify their manufacturing and marketing strategies to envisage maximum growth in the Cutaneous Mastocytosis Treatment Market in the upcoming years. The report provides detailed information about the current and future growth prospects of the Cutaneous Mastocytosis Treatment Market in the most comprehensive manner for the better understanding of readers. The report commences with the executive summary of the Cutaneous Mastocytosis Treatment Market, which includes the summary of key findings and key statistics of the market. It also includes the market value (US$ million) estimates of the leading segments of the Cutaneous Mastocytosis Treatment Market. Readers can find the detailed taxonomy and the definition of the Cutaneous Mastocytosis Treatment Market in this chapter, which will help them understand the basic information about the Cutaneous Mastocytosis Treatment Market dynamics, supply chain, cost structure and pricing analysis. A list of key distributors and suppliers, as well as a list of key market participants is included in the report. The report provides key market trends which are expected to impact the market growth significantly during the forecast period. Detailed industry trends are provided in this section along with new treatment approach or product innovations. This section includes key inclusions of the report. It includes regulatory scenario, disease epidemiology, pipeline assessment and reimbursement scenario for each region specifically. This chapter includes detailed analysis of macro-economic factors, forecast factors, market dynamics such as drivers, restraints of the market and opportunity analysis. This chapter includes a detailed analysis of the historical Cutaneous Mastocytosis Treatment Market along with opportunity analysis in the future. Readers can also find absolute opportunity for year (2018 – 2019) and incremental opportunity for forecast period. 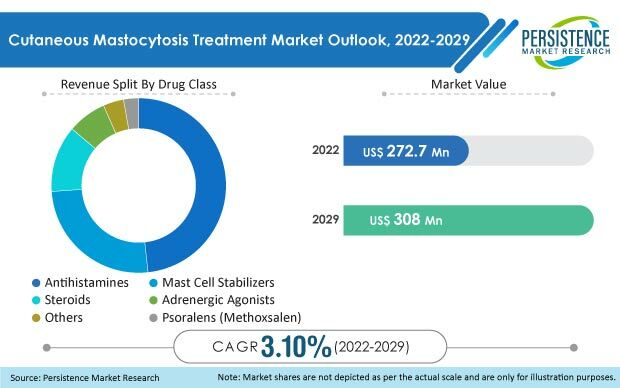 Based on the type, the Cutaneous Mastocytosis Treatment Market is segmented into antihistamines, steroids, mast cell stabilizers, Adrenergic Agonists (Epinephrine), Photo-chemotherapy / Psoralens (Methoxsalen) and others. In this chapter, readers can find information about the key trends and developments in the Cutaneous Mastocytosis Treatment Market and market attractiveness analysis based on the drug class. Based on the route of administration, the Cutaneous Mastocytosis Treatment Market is segmented into oral, injectables, topical and others. In this chapter, readers can find information about the key trends and developments in the Cutaneous Mastocytosis Treatment Market and market attractive analysis. Based on the indication, the Cutaneous Mastocytosis Treatment Market is segmented into maculopapular cutaneous mastocytosis, diffuse cutaneous Mastocytosis and solitary cutaneous mastocytoma. In this chapter, readers can find information about the key trends and developments in the Cutaneous Mastocytosis Treatment Market and market attractive analysis based on indication. Based on the distribution channel, the Cutaneous Mastocytosis Treatment Market is segmented into hospital pharmacies, retail pharmacies, drug stores and online pharmacies. In this chapter, readers can find information about the key trends and developments in the Cutaneous Mastocytosis Treatment Market and market attractive analysis based on the distribution channel. This chapter explains how the Cutaneous Mastocytosis Treatment Market will grow across various geographic regions, such as North America, Latin America, Europe, Asia Pacific Excluding Japan, Japan, Oceania and Middle East & Africa (MEA). This chapter includes a detailed analysis of the growth of the North America Cutaneous Mastocytosis Treatment Market along with a country-wise assessment that includes the U.S. and Canada. Readers can also find regional trends, regulations and market growth based on the end users and countries in North America. Readers can find detailed information about several factors, such as the pricing analysis and the regional trends, which are impacting the growth of the Latin America Cutaneous Mastocytosis Treatment Market. This chapter also includes the growth prospects of the Cutaneous Mastocytosis Treatment Market in the leading LATAM countries such as Brazil, Mexico, Argentina and the Rest of Latin America. Important growth prospects of the Cutaneous Mastocytosis Treatment Market based on its end users in several countries, such as Germany, the UK, France, Spain, Italy, Russia and Rest of Western Europe, are included in this chapter. In this chapter, China, India, ASEAN and South Korea are the leading countries in the APEJ region, which are the prime subjects of assessment to obtain the growth prospects of the APEJ Cutaneous Mastocytosis Treatment Market. Readers can find detailed information about the growth parameters of the APEJ Cutaneous Mastocytosis Treatment Market during the period 2018–2026. Readers can find important factors that can significantly impact the growth of the Cutaneous Mastocytosis Treatment Market in Japan during the forecast period based on the market segmentation. In this chapter, Australia and New Zealand are the leading countries in the Oceania region, which are the prime subjects of assessment to obtain the growth prospects of the Oceania Cutaneous Mastocytosis Treatment Market. This chapter provides information about how the Cutaneous Mastocytosis Treatment Market will grow in the major countries in the MEA region, such as North Africa, GCC Countries, South Africa and the rest of MEA, during the period 2018–2026. In this chapter, readers can find a comprehensive list of all the leading stakeholders in the Cutaneous Mastocytosis Treatment Market, along with detailed information about each company, which includes the company overview, revenue shares, strategic overview and recent company developments. Some of the market players featured in the report are Bausch Health Companies Inc., Pfizer Inc., Merck & Co. Inc., Mylan NV, Teva Pharmaceutical Industries Ltd., Sanofi S.A., Johnson & Johnson, Novartis AG, Bayer AG, Mallinckrodt Pharmaceuticals, EPI Health, LLC, and Kaleo Inc. This chapter includes a list of acronyms and assumptions that provide a base to the information and statistics included in the cutaneous mastocytosis report. This chapter helps readers understand the research methodology followed to obtain the various conclusions as well as important qualitative and quantitative information about the Cutaneous Mastocytosis Treatment Market. Cutaneous mastocytosis, a relatively rare disease, generally affects children below two years of age, and hence, diagnosis becomes difficult. Limited awareness among healthcare professionals as well as the general population delays the diagnosis and treatment of cutaneous mastocytosis. In the last decade, various non-profit organizations as well as government organizations have come forward to increase awareness about cutaneous mastocytosis, and since then, the diagnosis rate has increased substantially. Increasing awareness about the symptoms and treatment options has compelled the parents of newborns to visit physicians, which in turn, is increasing the diagnosis rate as well as treatment seeking rate in case of cutaneous mastocytosis. In 2016, the WHO updated the diagnostic criteria for cutaneous mastocytosis, which further helped in improving the diagnosis rate of the disease. In the last decade, substantial efforts by various organizations have been made in order to establish uniform diagnostic and treatment approaches. New diagnostic as well as prognostic parameters are set to make treatment easier and more efficient. Newly identified therapeutic targets with demonstrated clinical impacts are further expected to ease the management of the disease. For example, in 2016, the World Health Organization (WHO) updated the classification of cutaneous mastocytosis. The WHO further updated the criteria to define cutaneous involvement in cutaneous mastocytosis to differentiate it from other skin-related disorders that have cutaneous involvement. Depending on the mutation sites, diagnosis and approach towards cutaneous mastocytosis treatment are expected to improve in the coming years. A definitive, pathogenesis-based approach towards cutaneous mastocytosis treatment may improve therapy outcome. For example, a recent study published by the World Allergy Organization evaluated the mutation sites. Around 30% mutation sites in cutaneous mastocytosis are being reported to be exon 17 of KIT in children with cutaneous mastocytosis, whereas, another 30% children reported to have mutation outside exon 17 of KIT. Better understanding of the pathogenesis is expected to pave the way for better management of the disease, which, in turn, is expected to fuel the growth of the cutaneous mastocytosis treatment market. Various controlled studies are being undertaken to evaluate the actual epidemiology of cutaneous mastocytosis in different regions around the world. After the World Health Organization updated the classification, diagnosis, and treatment approach, numerous regions/countries went on to implement these very guidelines so as to improve uniformity in the diagnosis and treatment process. As of now, the epidemiology in United States and majority of European countries is evaluated, which is helping develop a novel treatment approach. Whereas, the data availability around cutaneous mastocytosis is still limited, but the situation is improving rapidly, specifically in developed countries where the prevalence of the disease is more. This part of the report consists of the profiles of the key players in the cutaneous mastocytosis treatment market based on their market shares, product offerings, differential strategies, marketing approach, and company dashboard. Leading pharmaceutical manufacturers in the market are focusing on enhancing their geographical product footprints, and investing in research & drug development for the cutaneous mastocytosis treatment market. The cutaneous mastocytosis treatment market is pretty fragmented, and it is mainly dominated by large pharma companies with diverse product portfolios as well as small and medium regional players. Manufacturers in the market are focusing on developing novel treatment options for cutaneous mastocytosis, since there is no cure available currently. Players in the cutaneous mastocytosis treatment market are competing on the basis of their regional footprint, product offerings, and prices of the drugs of same class. The cutaneous mastocytosis treatment market is dominated by Pfizer Inc., Novartis AG, Bayer AG, Merck & Co. Inc., Johnson & Johnson, and other key players. Manufacturers are engaging in mergers and acquisitions, as well as partnering with regional small- and medium-sized players in the market. Extended efforts by various manufacturers in the cutaneous mastocytosis treatment market are expected to enhance revenue generation. As per the Genetic and Rare Diseases Information Center (GARD), cutaneous mastocytosis is a heterogeneous type of rare disease that is characterized by lesions on the skin. There are three main types of cutaneous mastocytosis - maculopapular (also called urticaria pigmentosa), diffuse cutaneous mastocytosis, and solitary cutaneous mastocytoma. The causes of this disease varies, but generally, it is caused due to mutation in the C-kit of gene. The severity of symptoms may vary depending upon the type of cutaneous mastocytosis. The company conducted a research study on the cutaneous mastocytosis treatment market for the forecast period 2018 to 2026. The report offers a comprehensive evaluation of the business opportunities prevailing in the cutaneous mastocytosis treatment market, with insights on the prices, current trends, prevalence of cutaneous mastocytosis, and reimbursement scenario in the cutaneous mastocytosis treatment market. The report offers a comprehensive taxonomy of the market based on the drug class, route of administration, indication, distribution channel, and region. By drug class, the cutaneous mastocytosis treatment market is segmented into antihistamines, steroids, mast cell stabilizers, adrenergic agonists (epinephrine), photo-chemotherapy / psoralens (methoxsalen), and others. By route of administration, the cutaneous mastocytosis treatment market is segmented as oral, topical, injectables, and others. By indication, the cutaneous mastocytosis treatment market is segmented into maculopapular cutaneous mastocytosis, diffuse cutaneous mastocytosis, and solitary cutaneous mastocytoma. By distribution channel, the cutaneous mastocytosis treatment market is segmented into hospitals pharmacies, retail pharmacies, online pharmacies, and drug stores. The cutaneous mastocytosis treatment market has been analysed across the regions of North America, Latin America, Europe, Asia Pacific Excluding Japan, Japan, Oceania, and the Middle East & Africa (MEA). What is the overall revenue generation potential of the cutaneous mastocytosis treatment market across the regions of Europe and Asia Pacific? Who are the key regional and global competitors? What are their portfolios in the cutaneous mastocytosis treatment market? What are the major challenges influencing the growth of the cutaneous mastocytosis treatment market.